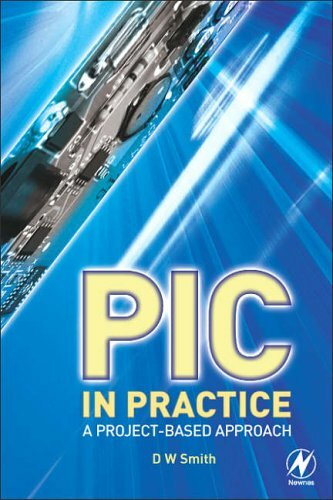 PIC in Practice is a graded course based around the practical use of the PIC microcontroller through project work. Principles are introduced gradually, through hands-on experience, enabling students to develop their understanding at their own pace. Dave Smith has based the book on his popular short courses on the PIC for professionals, students and teachers at Manchester Metropolitan University. The result is a graded text, formulated around practical exercises, which truly guides the reader from square one. The book can be used at a variety of levels and the carefully graded projects make it ideal for colleges, schools and universities. Newcomers to the PIC will find it a painless introduction, whilst electronics hobbyists will enjoy the practical nature of this first course in microcontrollers. PIC in Practice introduces applications using the popular 16F84 device as well as the 16F627, 16F877, 12C508, 12C629 and 12C675. In this new edition excellent coverage is given to the 16F818, with additional information on writing and documenting software.